Wilson Lourenco and co-workers recently published an article describing a new species of Buthacus Birula, 1908 (Buthidae) from the Tamanrasset region in Algeria. In the last 1520 years, the genus Buthacus Birula, 1908 (family Buthidae) has been the subject of an important number of studies. Most of the species considered in these studies come from North Africa and more recently our studies were concentrated in the Central deserts of Algeria. With the present study, we start a new series of contributions to the knowledge of the scorpions distributed in the South range of the country. 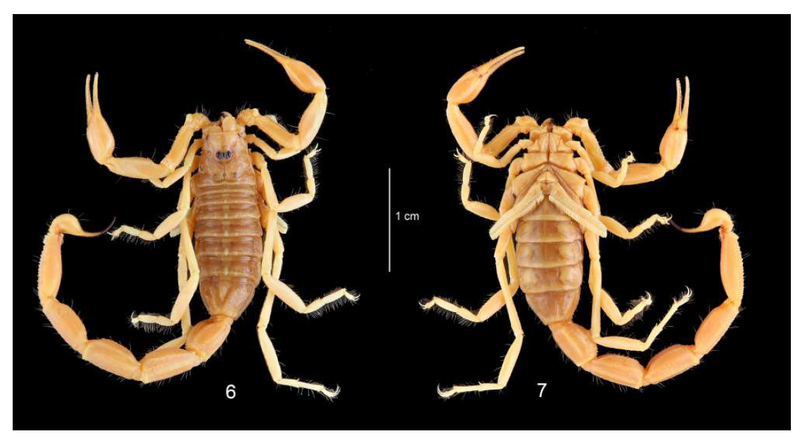 A new species of Buthacus is described from the southern Saharan Deserts of Algeria, raising the number of confirmed known species in this area to three and the total number of known species in Algeria to nine. This new discovery brings further evidence to the considerable degree of diversity found in the Algerian Saharan Desert but in particular suggests once again the presence in these deserts of microendemic populations. Lourenco WR, Kourim ML, Sadine SE. Scorpions from the region of Tamanrasset, Algeria. Part I. A new species of Buthacus Birula, 1908 (Scorpiones: Buthidae). Arachnida - Rivista Aracnologica Italiana. 2017;3(8):31-41. Thanks to Salah Eddine Sadine for sending me their article! Vorherige News Drei-Meter-Königspython... oder Netzpython... oder was? Nächste News Was sind eigentlich… invasive Arten?